Trix 22029 Freight Steam Locomotive with a Tender Prototype: Bavarian class G 5,5 heavy freight steam locomotive with a type 2,2 T21,8 tender. Prototype: Bavarian class G 5/5 heavy freight steam locomotive with a type 2´2 T21,8 tender. Design version from the third production series. Group Administration Bavaria dark green basic paint scheme for the German State Railroad. Road number 5856. The locomotive looks as it did around 1923. Model: The locomotive has a digital decoder and extensive sound functions. It also has controlled high-efficiency propulsion with a flywheel, mounted in the boiler. 5 axles powered. Traction tires. The locomotive and tender are constructed mostly of metal. A 72270 smoke unit can be installed in the locomotive. The dual headlights change over with the direction of travel. They and the smoke unit that can be installed in the locomotive will work in conventional operation and can be controlled digitally. A third light on the front of the locomotive and on the tender for on-coming trains changes over with the direction of travel and can be controlled separately in digital operation. Maintenance-free warm white LEDs are used for the lighting. There is a close coupling with a guide mechanism between the locomotive and tender. The front of the locomotive and the rear of the tender also has a close coupler with a guide mechanism and an NEM pocket. The minimum radius for operation is 360 mm / 14-3/16". Piston rod protection sleeves and brake hoses are included. Length over the buffers 23.5 cm / 9-1/4". Freight cars to go with this locomotive can be found in the Marklin H0 assortment under item numbers 46085 and 46803 with appropriate references to the wheel exchange program for DC wheel sets. 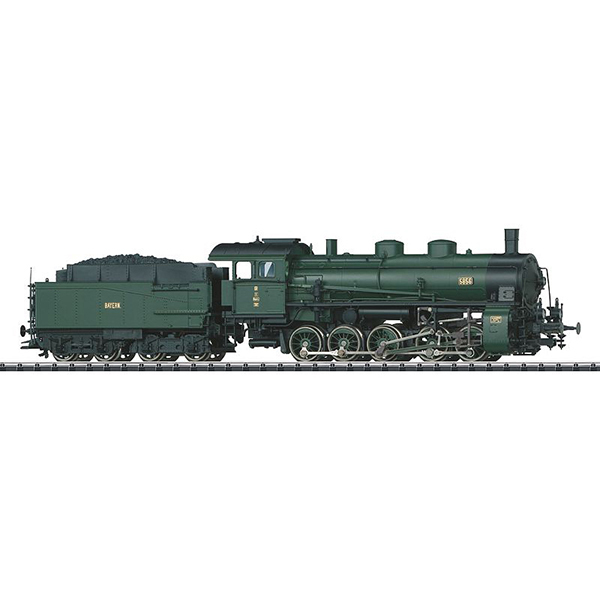 This model can be found in an AC version in the Marklin H0 assortment under item number 39550.